Gorgeous!!!! 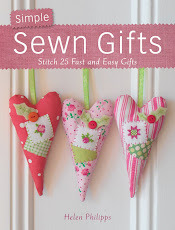 I love the gift idea. I have to send some homemade gifts for a facebook "pay it forward" thing I joined and now I know how I will wrap them. I love all of your pictures. I think I will give some hints to my husband that I would like tulips for Valentine's Day. Hi Helen! I love everything in your post! 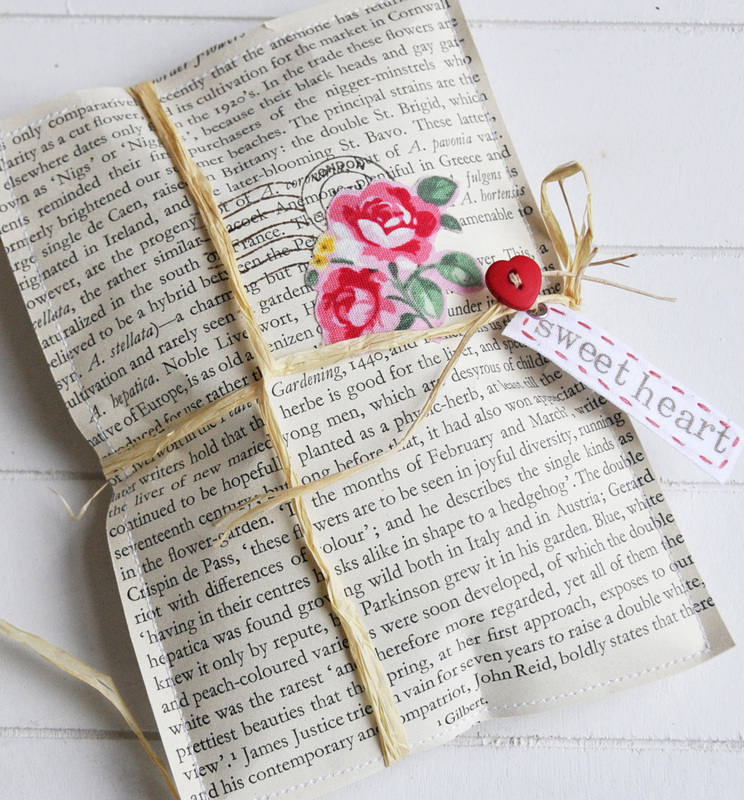 Great idea to make gift bags with book pages and so lovely decorated! And for the candles they are so pretty! I shall look more about the magazines. Your cross stitching samplers are so beautiful - I only wish I could have time for that, too! Last photo is so sweet! I really love the gift wrapping!!! you have been really busy my dear!!!! 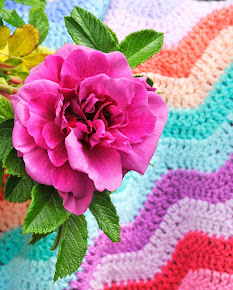 Your blog and cheery colors are so happy and joyful! what a creative soul you are! Everything you do is wonderful!!! 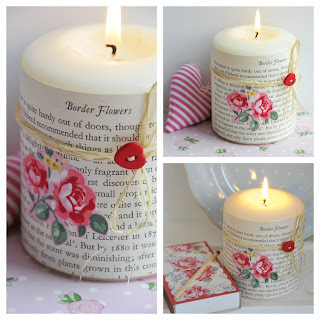 Gorgeous post, really love the candle, great idea & the pink heart is so sweet. Your blog is so colourful and inspiring. I do love tulips such cheerful little flowers. Your magazine commissions are as always brilliant! Another amazing post! Too beautiful photos! Thanks so much for sharing.Love the gorgeous little bird. Your posts are always so bright and springy looking, it makes me think that spring is really soon and makes me so happy! I love your gift ideas and seeing those tulips. Have a great day! Your brand new book has just arrived!! I can't wait to start on a project or two!! 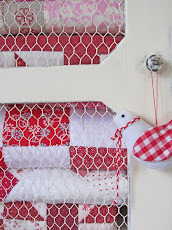 Helen, thank you so much for sharing all the lovely ideas in this post. Making use of damaged old books with beautiful type faces is a splendid notion. I particularly like the gardening book mixing along with your floral cut-outs. 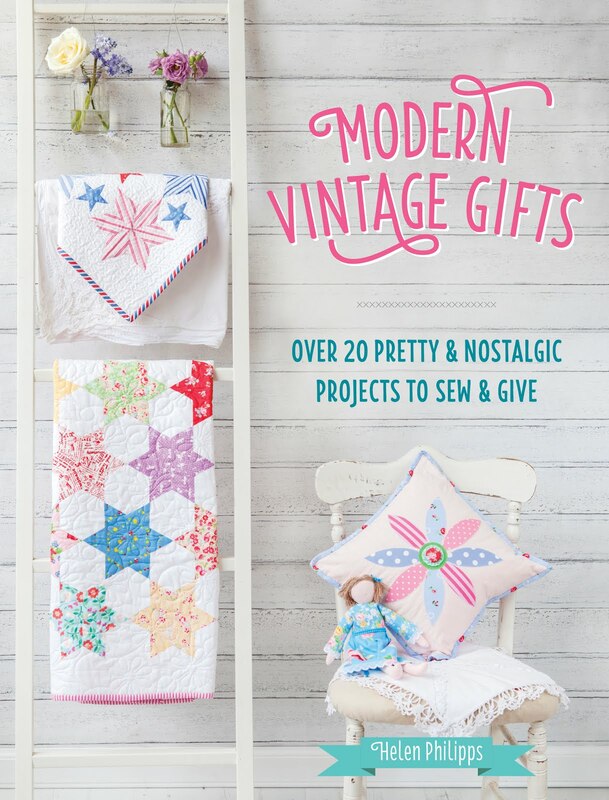 It's grand to see your designs are appearing in many new publications. 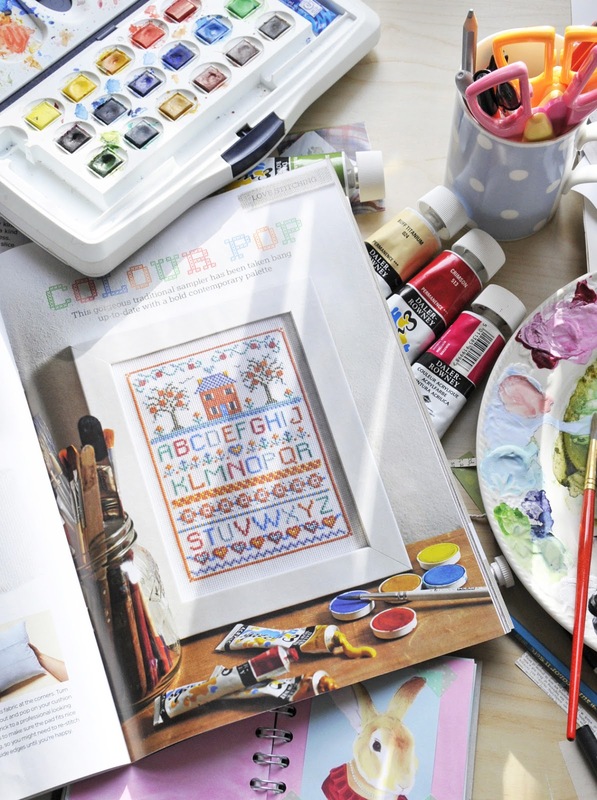 How true it is that your cross stitching aligns with watercolor painting. Right now, NYC weather is very far from spring like, so it's fun to see a little preview of that lovely season right here on your post. 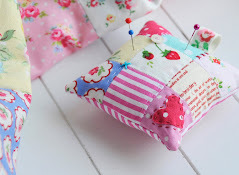 What a beautiful little package, such a fab idea Helen, i am going to give this a go! Looking at your blog makes me so happy.Especially during these gloomy winter months. 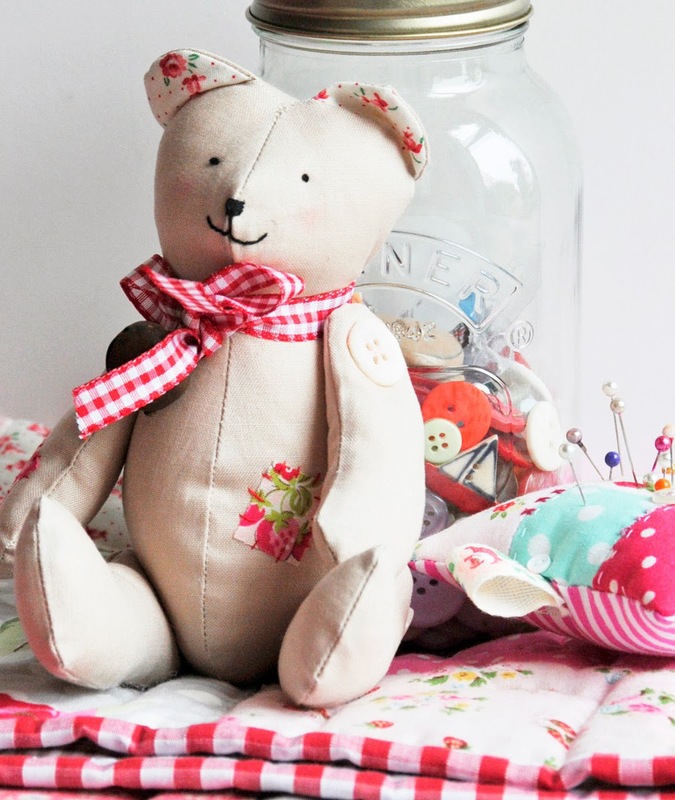 Always wonderful projects going on in your studio, Helen! I just love the little bird on the pillow--how fun! What a great idea to do the wrapping, unwrapping the present is a present in itself. Such a beautiful post. It made me smile the entire time. Tank ou. 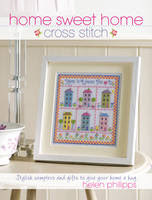 How wonderful it must be to see your designs in print Helen and the photographer did a really good job too. 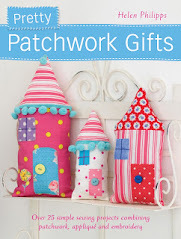 Those stitched packages are really original and so easy to open, no tacky tape to get through. Thanks for sharing some tulip love..the day's are slowly getting lighter and like you I am really looking forward to the spring. That's a great idea for the surprise parcel, and I adore the print candle wrapper - such a pretty idea. Gorgeous tulips, everything looks so springlike here, if only the weather matched! 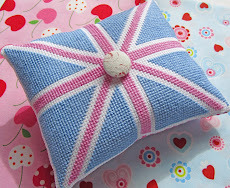 Thanks for sharing all your lovely makes Helen, its such a pleasure to see them all. Dear Helen, just love the name 'Miss Hyacinth' ... reminds me so much of 'Keeping Up Appearances'!Love that show! 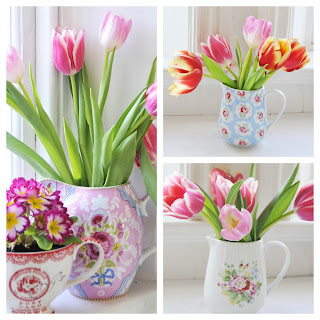 Another Spring blog today and I have really appreciated your blogs this winter.... I can always count on being transported in to Spring despite the horrible Winter weather. I've just popped out for some milk and returned with a bunch of tulips as well!! More pretty eye candy! Your blog is SO beautiful!! 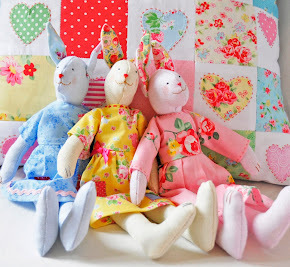 I love all your beautiful bright creations, all the gorgeous colours and fabrics. The tulips are so pretty and you must be having Spring there soon. Love darling Miss Hyacinth too - our little blue Persian cat was named after the fabulous Mrs Bouquet. Your book should be in my mailbox tomorrow. I can't wait! I just love your gift packets and candles, so lovely. 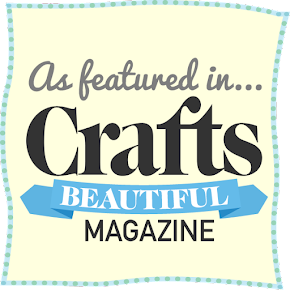 I will definately look out for all of the magazines you have mentioned, your designs look gorgeous. Loving the paper parcel. So simple but effective. You are so clever. Love the idea with the paper. Will have to try this when I next send a gift to a friend. Thank you. Your tulips are beautiful Helen, and I love what you've done with the candle. And such a pretty matchbox ... you do find the loveliest things! Love the little heart and the flowers you get at your grocer are GORGEOUS! We have the ugliest "dyed" daisies and roses that smell like mildew. We can't get decent flowers nor any variety at all. Isn't that amazing how the photographer set your stitchery up and then your photo was like the mirror image! Yes, I think Spring will be early here this year. The robins are back and it's been warmer and sunnier. I love your little bluebird. Oh, and the packages...those are truly unique and just darling. I have lots of old books that are falling apart and of no value that I could use. I hate to throw things out if I can find a use for them...especially a pretty one! 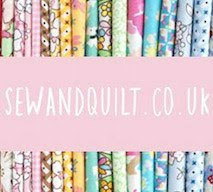 You're blog is lovely again, as usual! I really love the heart and great ideas you give! 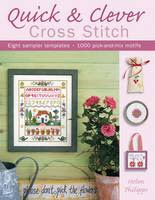 I really liked the cross stitch sampler in CrossStitcher I hadn't realised it was one you had designed! It is firmly on the to do list!! Ooh I love all of these! You have been busy. I must check out the mags and see your projects. 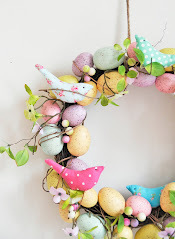 Your little hearts are just so perfect and I want to make some similar to cute up my house> what fab inspiration. Going to Amazon to check out your book and will need to find the magazine too! Thank you for sharing. Love your paper packages Helen, super idea! I would love to put my name in the hat for Miss Hyacynth please! I missed the awful weather as I was in Andalusia celebrating my silver wedding anniversary, lucky me! I was away for a couple of weeks and am catching up on your beautiful posts. 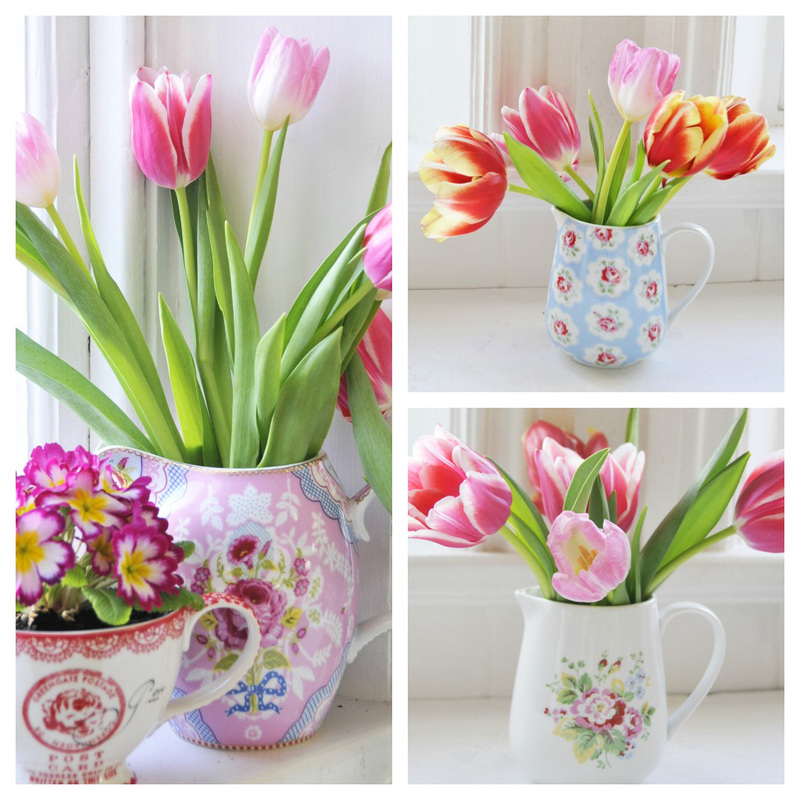 I do love the flowers in a pretty cup! I hope the upcoming week is a wonderful one for you, Helen. Oh c`est très jolie se que vous avait fait!! 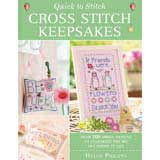 Wonderful ideas and I have just been looking at your book on Amazon - it has gone straight onto my wishlist - lovely! Helen, your gift packet and candle are too beautiful! It's always such a joy (and so inspiring!) to pop in and visit you. So gorgeous! What a nice gift idea! 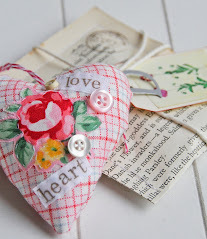 I love the idea of reusing old (damaged) books to make something once unloved into a useful item. Helen, that candle is magnificent, I love it. Devastated to have missed out on your giveaway! fyi I guess no one has noticed....The words on this package has racist descriptions against a people group. Read 4th line from the top.